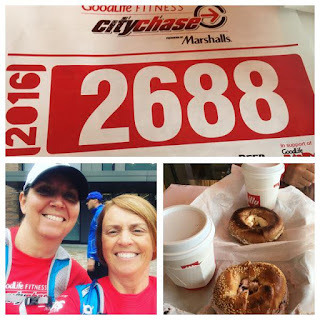 So yesterday I did a different kind of race, Anita and I did the City Chase..maybe it should have been called the Weather Chase but more about that. The City Chase has been on my must do list for a few year. As a huge fan of The Amazing Race and the Amazing Race Canada I had wanted to do this part obstacle course, part scavenger hunt race and pretend I was somewhere exotic and Phil or Jon was waiting for me at the finish-line ready to give me a big cheque...enough about my fantasy though. Anita and I signed up and then Neale and Andre signed up so it was also a battle of the sexes, may the better team win. 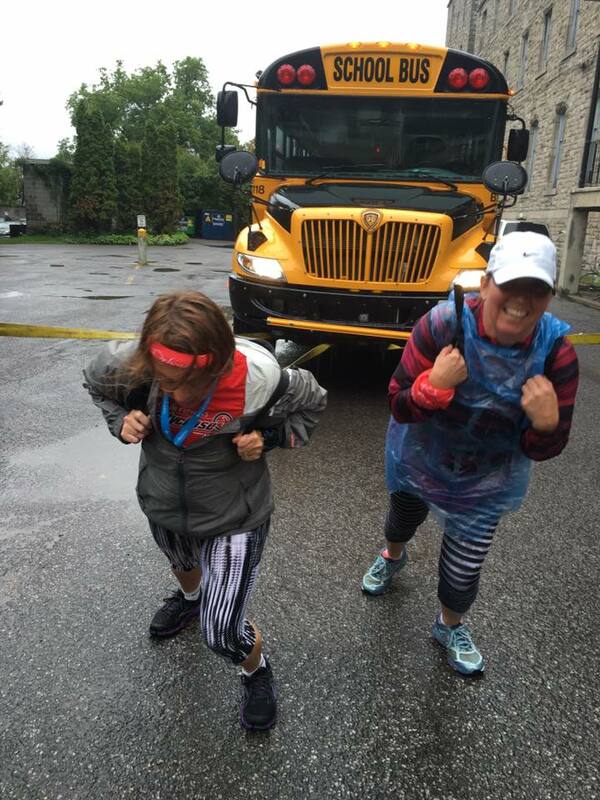 Anita and I headed to TD Place early to picked up our bibs and T-shirts and then headed to the bagel shop for some food and while there it started to rain, and the day continued that way, rain on and off, thunder and lightening and general comfortableness. At 10am the heavens opened, thunder crashed and we were off, Anita ran one way to get one page of our clues, I the other to get the other page and then we were standing in the rain looking for each other. We eventually regrouped and headed to the underground garage to get a notebook and pen and plan our strategy. The City Chase give you 2 pages of clues to find the addresses to do the obstacle to get a chase point, you need 10 to finish and you have 6 hours. We spent about 40 mins getting the addresses we needed, a few from friends on Facebook, thanks for the help, Rose, Leah and Amy and then headed out. It was raining and a lot of the Chase points were closed so the indoor ones where getting really popular and had long lines. Our first stop was a dance studio where we did the ChaCha. I used the time in line to watch a how to ChaCha video so we quickly finished that one and headed to the next. The next one involved Anita trying to hit an apple off my head with a bow and arrow. Let's just say Anita was blindfolded and I am short so after 10 "arrows" they gave us the chase point and we were off. Another team gave us misinformation for the third Chase Point but it worked out OK and we quickly re-routed and hopped on a bus for 2 stops to our third stop where we got to pull a bus, can I say that was really hard and my knees are still sore but oddly satisfying. We zoomed through the next two Chase Points, we were soaked, hungry and need a bathroom so we stopped at my office and took advantage of the large computer screen instead of our phones and plotted our last 5 Chase Points. The trick to this is plotting a critical path so you are not going back and forth across the city and we were in luck, there were 5 fairly close together. I solved a puzzel while Anita ran on a treadmill at GoodLife, we Escaped the Room in about 3 mins, we, I should say Anita rocked the semaphore challenge and then we had 2 left. A long bus ride put us back in the Glebe and we finished up on Glendale and Craig St and ran to TD Place. We finished at 3:18 pm, tired, wet and starving but where were the guys? Let's just say if this was my fantasy, Phil or Jon would have given Anita and I the cheque and I will leave them to tell their own tale. 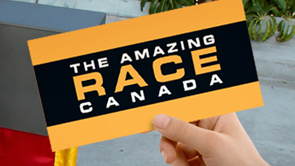 I had a great day, hope to do it again next year and who knows, maybe Anita and I will turn up again on the Amazing Race Canada one day...anything is possible if you want it enough.